A few Sundays ago, I spoke about how the church’s overemphasis on belief has watered down Christianity into something more about our heads than our way of life. Just to remind you, I gave you this analogy: “I believe” is a lot like saying “I do” when you get married. Saying “I do” is pretty easy…well, for most of us. But actually living your “I do” is much more complicated. Saying I do is not what marriage is about. Making concrete choices each day to extend love to another person…that’s what marriage is about. And saying “I believe” works the same way. The basic distinction I made in this sermon was between orthodoxy and orthopraxy. Orthodox meaning right belief. Orthopraxis meaning right practice. Well, one of the great faith leaders and spiritual teachers of today who is focused on orthopraxy is Richard Rohr, a Franciscan Friar, faith leader and spiritual teacher. Rohr emphasizes in his writings that lifestyle and practice are much more important than mere verbal consent to beliefs. So naturally Rohr writes a lot about the spiritual life, its practices, rituals, and the journey through life as a person of faith. In his book Adam’s Return from 2004, Rohr writes about male spirituality, particularly the process of maturing spiritually as a male. Rohr argues that early in the male life is the social urge to fight, scrape and claw to the top. During this time, men are often rigid about words, ideas, and rituals because they lack any real inner experience. We have a confident, egocentric, “I know what I’m doing” attitude, a”Here’s where I am going and this is how I’m gonna get there” attitude. But through the successes and failures of life, the healthy man begins to see the the futility of clawing to the top. He begins to see the through his rigid perception of himself and the world because of experiences that challenge him. And if the man is to truly enter into spiritually mature manhood, then according to Rohr, that man must learn to deal with his limitations and mortality He outlines 5 strands that are part of this journey to manhood. I am not going to tell you all 5, you will have to get the book! But I will share the beginning point, the first strand or stage. It’s this: Life is Hard. Contrary to the movies and popular belief, Initiation into manhood is less about being a warrior than about being conscious, awake, alert. This first strand is about facing the issues of life and dealing with pain. Because as Rohr has famously said, “If we do not transform our pain, we will transmit it” in some form. We will become inflexible, blaming and petty as we grow older. We will need other people to hate in order to expel our inner negativity. We will play the victim in some form as a means of false power. We will spend much of our life seeking security and status as a cover-up for lack of a substantial sense of self. We will pass on our deadness to our family, children and friends. If we do not transform our pain, we will pass it on. This is a truth not only for men, but for all of us. How do we transform our pain? There are few things in this world that will truly aide you in transformation. There plenty out there that will trick you into ignoring pain, suppressing it, managing it or transmitting it. But there is this way of life taught by a Palestinian Jew who faced ultimate pain on a cross and transformed that pain through God by rising from it into a new life. 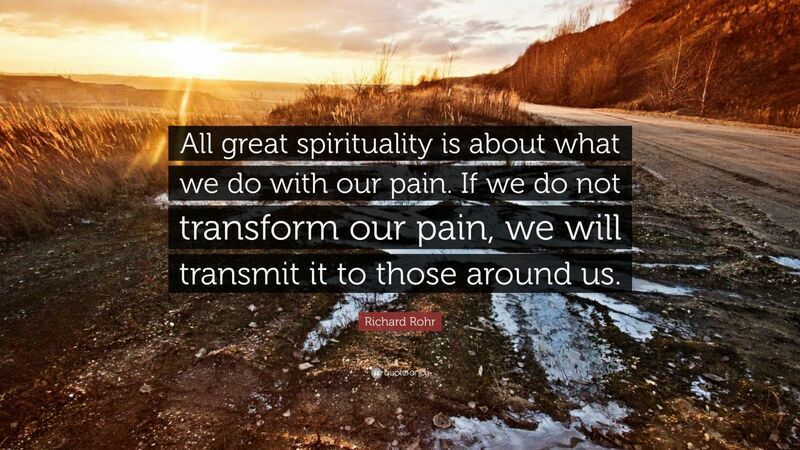 And that is our model for transforming pain and it’s why faith and spirituality are so important in our lives. Friends, when life gets really difficult, don’t jump to the conclusion that God isn’t on the job. Instead, be glad that you are in the very thick of what Christ experienced. This is a spiritual refining process, with glory just around the corner. If you’re abused because of Christ, count yourself fortunate. It’s the Spirit of God and his glory in you that brought you to the notice of others. Therefore, humble yourselves under God’s power so that he may raise you up in the last day. Throw all your anxiety onto him, because he cares about you. Be clearheaded. Keep alert. Your accuser, the devil, is on the prowl like a roaring lion, seeking someone to devour. Resist him, standing firm in the faith. Do so in the knowledge that your fellow believers are enduring the same suffering throughout the world. After you have suffered for a little while, the God of all grace, the one who called you into his eternal glory in Christ Jesus, will himself restore, empower, strengthen, and establish you. To him be power forever and always. Amen. How do we transform our pain? This teaching begins to answer the question. It puts our pain and suffering in perspective – pain can be a process of spiritual refinement. Your bible might say test – I am not a fan of that translation because the word test suggests that someone is giving it to us on purpose and we too often take that to mean that God is intentionally giving us suffering in order that we must prove something to him. That is not what is going on here. Rather, the pain and suffering we experience is most often the result of a world that treats us terribly. what makes suffering part of a process of spiritual refinement is we receive it that way. This gives us perspective on our suffering and that is a first step in transforming our pain. The passage also tells us to cast our cares upon God. Or as I read, throw your anxiety upon God because he cares about you. Anxiety, stress, troubling thoughts, insecurities, worries, pain and suffering – throw them all upon God, throw them at the feet of Christ. How? Well, too often the way we cast our cares is really not much more than ignoring them. We mentally give them over to God, but in reality we just put them out of our heads believing that means we have given them to God. How do we turn over our anxiety? Tell Jesus all about it just as you would a friend. Casting your cares means actually putting getting them outside of yourself and then giving them to someone else. You can only do that by talking about your cares, lay it all out to Jesus – every thought no matter how raw and messy they are. I was talking with a counselor friend this week about how the most important aspect of counseling is listening. A lot of folks think counseling is about getting answers from someone who is wiser or has insight into our psyche. But actually counselors can do a lot of damage when they give advice. And I bet some of you could tell me stories about how a counselor messed you or someone you know up by telling them what to do…and it just did not work. Joanie and I even have our own story about how a counselor messed some of our friends up pretty bad. Jesus is the great counselor – the best listener we could hope for. And when we share every detail with him in pray, that is how we cast our cares upon him. We do not ignore the feelings within us. We do not hide anything. We do not suppress our anxiety. Instead we tell him everything. Good or bad. Right or wrong. Black white or somewhere between. You let it all out. Jesus can handle anything you throw at him. Because that is how much he loves you. He took everything you are struggling with…and he went to the cross with it. And he will do it again if you will just honestly and authentically tell him all about it today. Bear in mind, I am not suggesting that you can do that all in one sitting, not all within one pray time. As with any counselor, it can take multiple sessions to tell whole story, to give over everything detail, to really identify everything you are thinking and feeling. So casting your care upon Jesus is not some one time thing. It is a process. It is a little like casting a fishing line. You have to casting it out, real it in, cast it out again, reel it in, and keep on casting…until finally you full in a fish. It takes time. Now I could keep taking about prayer here. But because we too often think of prayer as talking to God, I want to be specific about how we must listen. In fact, prayer really has more to do with listening than talking – even though from the average prayer of folks today you would think prayer has nothing to do with listening. So just to be clear: we must meditate. We must take time to focus and reflect upon what God is saying to us. Not what our anxiety is saying to us. Not what our feelings or thoughts are saying to us. Not what the world around us is saying. But what God is saying. And that is some of the most difficult listening that we have to do. Far too often folks come forward with something God said to them or told to them, and really it is what their our ego said to them or what their emotions said or what a parent or child said. Discerning what God is truly saying to us and what is just our own desires is much more difficult than we imagine. First of all, it takes times to sort through what words are from our self and what is from God. Meditation is the practice of sifting through everything within our mind, our heart and our soul to discern what is God’s word. And that can take many forms. It may mean sitting in silence and stillness to reflect or too empty the mind until there is clarity. It may also mean doing something a time that helps you clear your mind. I have often found that weeding the garden is a great form of meditation for me over the years. It gives me something tangible to do that is just like what I am trying to do with my thoughts…that is, separate the weeds from the fruit. Weeding my mind is a lot like weeding the garden. And so meditation can look like a lot of different things. The point is that it is a practice of listening, discerning, reflecting, sifting and sorting of the mind heart and soul that leads one to clarity about yourself, the world, and God. So it is great to pray and to meditate. And yet that can often be very individualistic. The truth is that we need one another because we hear and experience God through community. Last week, I talked about how seeing and recognizing the work of the Spirit is about community. The spirit is known and experienced through community, not in the isolation of the individual. We look at how the gospel of John talk about the spirit through the language of y’all, not you the individual. When we come together, the spirit is manifest through our collective wisdom and work. Casting our cares upon Christ is also about community. Part of the way we as Christians who are part of the body of Christ tangibly cast our cares is by sharing with the other members of our body. If we as the church are the body of Christ, then the way we throw our anxiety to Jesus is by allowing the entire body of Christ to hold and support us through our anxiety. Think about what would happen to your body if your foot did not share its pain with the rest of your body. Let’s say you step on a rusty nail. But your foot doesn’t want to share it pain, it wants to deal with it itself. So it keeps the pain within itself, suppressing the pain, minimizing it, looking up smiling at the rest of the body even though it is crying inside because it hurts so much. Eventually that foot gets pretty sick. Tetanus sets in, perhaps gangrene, and before long the foots sickness isn’t just about the foot. It is affecting The Whole body. But the body has no idea why it is having trouble cause the foot still isn’t sharing its pain. There no treatment cause the body doesn’t know the foot needs helps. There is no conversation, no support, no extra blood to heal the infection. Nothing. You can see where this is heading right? Before long the body eventually figures out what is happening…..cause the foot looks so terrible it can,t hide the pain anymore….it’s not working properly, it’s probably turning colors, oozing…who know what kind of gross things are happening. All this can be avoiding by simply sharing pain with the body so that the body can help support nurture, heal and comfort the suffering member. When you share with your faith family, you have so many others walking the journey with you…praying for you, checking in on you, watching out for you, having your back when difficulty comes your way, preparing a meal when life is overwhelming…the ways we can support one another are endless. Life is hard, just a Richard Rohr said. But it is less hard when we talk about how hard it is. It is less hard when we listen for God’s wisdom and insight by setting aside our ego and discovering something deeper about ourself through God,s eyes. And it is less hard when we share the difficulty with our family of faith and receive the care, compassion and support that our family has for each one of us. Life is hard. But when life is hard we are at the threshold of spiritual refinement, of learning and practicing something new that is absolutely central to our life and our faith. Let us all follow Christ on the cross through the pains and difficulties of our lives and rise into new life, into spiritual maturity, into the way of God through Jesus Christ our Lord. Amen.